An architectural marvel with a complex history. Suzdal. Intercession Convent. ​Intercession Cathedral&bell tower with Church of Procession of the Righteous Trees. Southeast view. March 5, 1972. At the beginning of the 20th century, the Russian chemist and photographer Sergei Prokudin-Gorsky developed a complex process for color photography (see box text below). Inspired to use this new method to record the diversity of the Russian Empire, he undertook numerous journeys across the country over a period of 13 years. 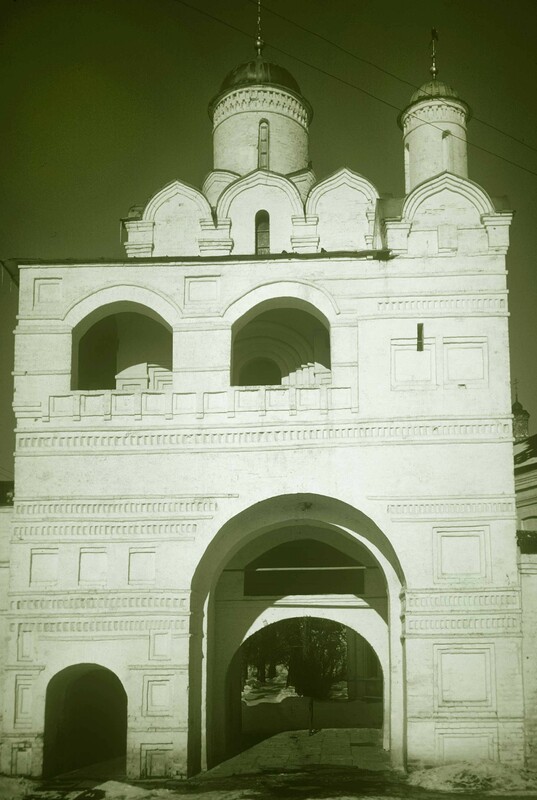 His vision of photography as a form of education and enlightenment was demonstrated with special clarity in his photographs of medieval architecture in historic settlements northeast of Moscow such as Vladimir, Suzdal and Pereslavl-Zalessky. 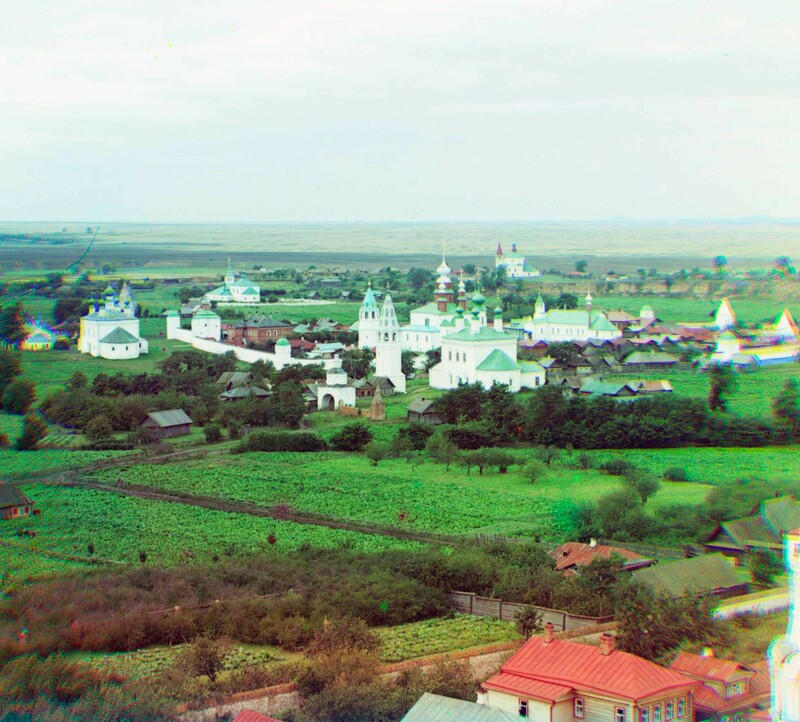 In summer 1912, Prokudin-Gorsky visited Suzdal, an ancient center of Russian heritage, Due to its lack of a rail link and with little industry, Suzdal retained the bucolic atmosphere captured so poignantly in Prokudin-Gorsky’s photographs. At the time of his visit, the town had about 7,000 inhabitants (current population 10,000), and an extraordinary concentration of churches and monasteries. 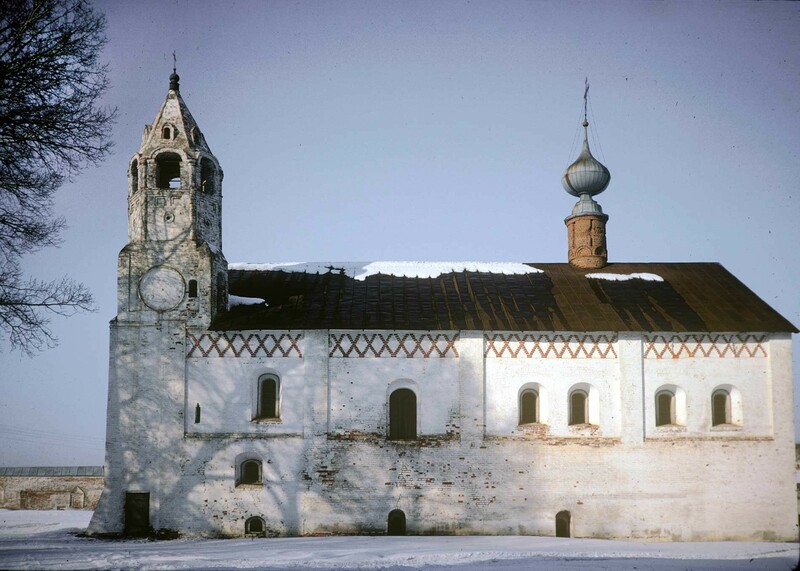 In his Suzdal work, Prokudin-Gorsky gave special attention to the monastic institutions, including the Convent of the Intercession, which played a momentous role in Russian history. I photographed this landmark ensemble, with its whitewashed walls and towers, over the period of several decades beginning in 1972. A comparison of our photographs shows numerous changes during the restoration of the architectural ensemble. Founded in 1364, the convent was built entirely of wood until the early 16th century, when it drew the favor of Moscow’s Grand Prince Basil III. With his support, work began in 1510 on the Cathedral of the Intercession of the Virgin, consecrated in 1514. Intercession Convent, northeast view from Savior-Evfimy Monastery. Center:​Intercession Cathedral. Right: Church of St. Anne. Left: Church of Sts. Peter&Paul (beyond convent). May 29, 2009. This brick structure displayed features of Muscovite churches, such as the pointed decorative kokoshniki in an octagonal arrangement at the base of the drum supporting the central cupola. Over the centuries, this vertical crown was modified and heightened with a baroque dome, which is visible in Prokudin-Gorsky’s photograph. A restoration in the late 1950s by the renowned specialist Alexei Varganov returned the cupola to what is presumed to be its original form as seen in my photographs. 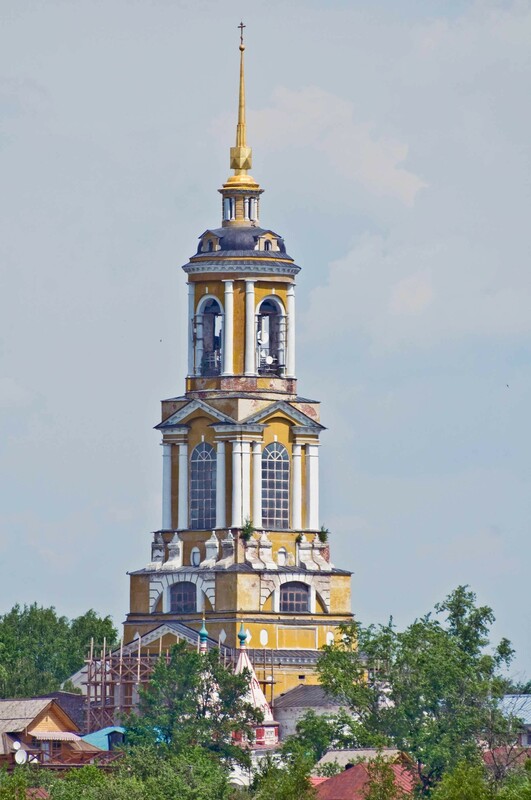 In addition to its main cupola, the Intercession Cathedral has two smaller cupolas (restored by Varganov) over chapels located at the eastern corners in the style of the Annunciation Cathedral in the Moscow Kremlin. Suzdal. Bell tower of Convent of Deposition of the Robe from which Prokudin-Gorsky photographed the Intercession Convent. May 29, 2009. The facades of the Intercession Cathedral display blind arcading and culminate in a row of rounded gables (zakomary) — devices common in Suzdalian architecture before the Mongol conquest (1237-40). These forms were revived in the late 15th century with the rebuilding of the Dormition Cathedral in the Kremlin. 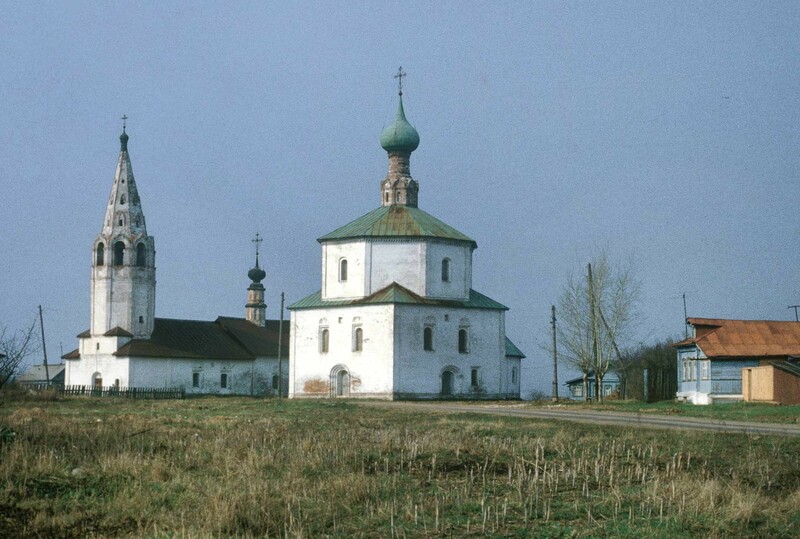 Leveled in the 18th century, the zakomary were also restored by Varganov. The core structure is graced with an elevated gallery along three facades. The adjacent bell tower dates from the same period and is connected to the southwest corner of the cathedral gallery. 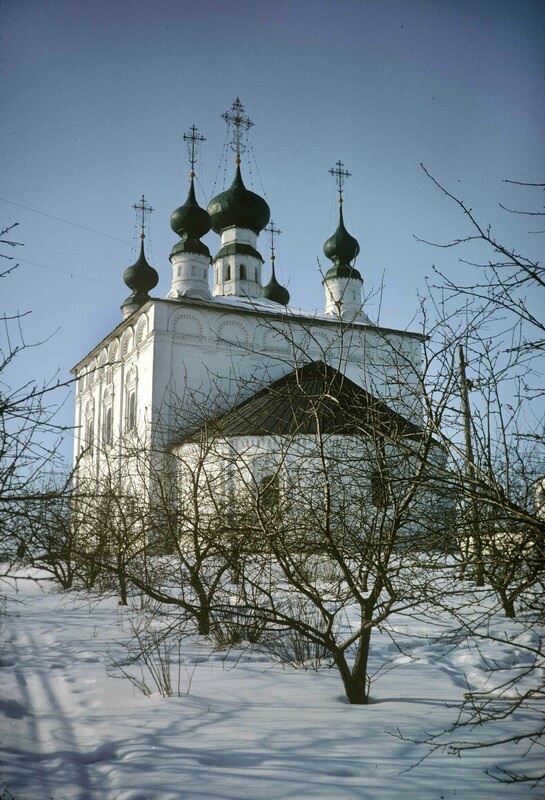 The polygonal tower originally had a second-floor chapel dedicated to an Orthodox holiday known as the Procession of the Virtuous Trees of the Life-Giving Cross. Although rebuilt in the 17th century, this structure may be one of the earliest examples of a brick tower church in Muscovy. Intercession Convent, southeast view from bell tower of Convent of Deposition of the Robe. Foreground: entrance gate, bell tower&Ascension Church at St. Alexander Convent. Beyond Kamenka River, from left: Church of Sts. Peter & Paul, Gate Church of Annunciation, Intercession Cathedral. Summer 1912. The convent's gate church, dedicated to the Annunciation, was built around 1516. 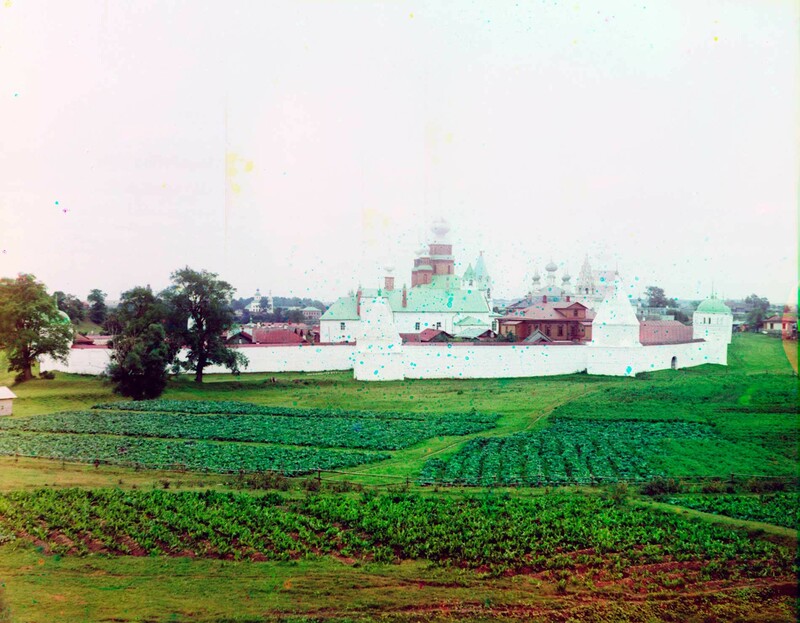 A distant view in Prokudin-Gorsky’s photograph shows a structure much changed over the centuries. My 1972 photograph shows the result of Varganov’s restoration. Its design has three cupolas and the main drum in miniature replication of the convent's cathedral. The proportions of the Annunciation Church, with its arcaded gallery on the upper level and recessed entrance arches, shows a masterful handling of form that suggests the work of Kremlin masons. Kremlin involvement is especially plausible since the above structures were associated with a votive offering from Basil III and his first wife, Solomoniya Saburova (ca. 1490-1542), in supplication for the birth of an heir. Unfortunately, their prayers went unanswered. Solomoniya, the offspring of a prominent Tatar family, was admired for her good character and beauty, but the passage of years without a child undermined her position at court. Intercession Convent. Gate Church of Annunciation, south view. Photograph: March 5, 1972. By 1525, the lack of a male heir and threat of dynastic instability led Basil, with the support of Metropolitan Daniil, to the difficult decision to annul his marriage. 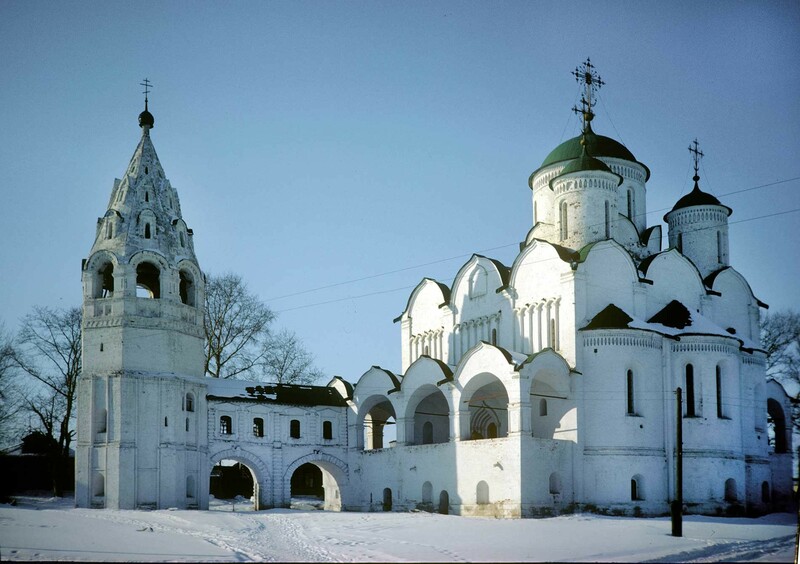 Solomoniya was taken to Moscow's Convent of the Nativity of the Virgin, where she assumed the religious name "Sophia". Shortly thereafter, she was sent to more distant exile at the same Suzdal Intercession Convent that she had known a decade earlier as a supplicant. She died there in December 1542. Basil's subsequent marriage in 1526 to Elena Glinskaya (ca. 1508-38) finally produced a male heir — Ivan IV — in 1530. Suzdal. Church of Sts. Peter&Paul, southeast view. March 5, 1972. Solomoniya's tragedy became the source of legend, and by the latter part of the 16th century, Solomoniya-Sophia was revered as a saintly figure and even martyr. 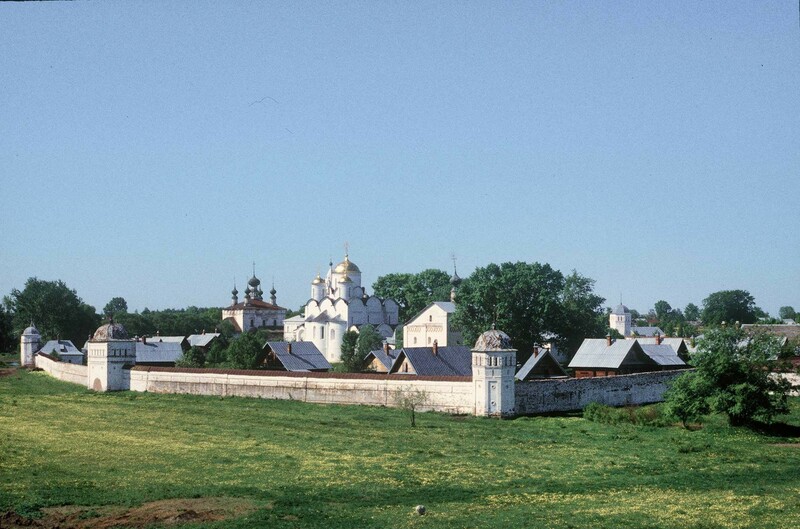 Miracles were subsequently attributed to her power, and in 1650, Patriarch Joseph permitted her local veneration as Sophia of Suzdal, a decision that increased the number of pilgrims to the Intercession Convent. Solomoniya-Sophia would not be the last women of noble status to be sequestered within the Intercession Convent. Among these unfortunates was Anna Vasil'chikova, whom Ivan the Terrible took as his fifth "wife" in 1575. She was soon thereafter compelled to enter the Intercession Convent, where she died in 1579. Suzdal. Church of Elevation of the Cross (left)&Church of Sts. Cosma & Damian in Korovniki. Southwest view. April 27, 1980. The most notorious case was that of Eudoxia (Evdokiya) Lopukhina (1669-1731), the first wife of Peter the Great. The marriage, which produced three sons (two of whom died in infancy), was unhappy, and the Lopukhin clan had little sympathy for Peter's inclinations toward Western culture. In 1698, the exasperated Peter demanded that Eudoxia take monastic vows (under the name Elena) and sent her to the Intercession Convent, where she spent the next 19 years of her life. But the macabre story did not end with her exile. In 1716 Peter had suspicions of a plot against him that involved their son and the heir to the throne, Alexei (1690-1718). Increasingly fearful, Alexei made an abortive flight to Austria in 1717. After the return of Alexei at the beginning of 1718, prolonged interrogations caused his death that summer. Intercession Convent, northeast view from Savior-Evfimy Monastery. From left: Church of Sts. Peter & Paul (beyond convent), ​Intercession Cathedral with three restored domes, refectory&Church of St. Anne. May 29, 2009. The ramifying investigation led back to Eudoxia, who was found to have disregarded monastic strictures by maintaining amorous relations in 1709-10 with Stepan Glebov, an army officer of noble origin. Although no conclusive evidence has been found to link Eudoxia’s sympathizers with Alexei’s flight, Peter was enraged by information about Glebov’s behavior. In March 1718, Glebov was subjected to prolonged torture then savagely executed on Red Square, and Eudoxia was sent into harsh exile at the distant Ladoga Dormition Convent. The repercussions of the "Suzdal affair" were to echo in other arrests for years thereafter. These gloomy episodes from Russian dynastic history now seem remote from the picturesque ensemble that Prokudin-Gorsky and I photographed over the span of a century. Used as a tourist base in the late Soviet period, the convent was returned to the Orthodox Church for active use in 1992. Intercession Convent. Refectory&Church of Conception of St. Anne, south view. March 5, 1972. One of the most appealing monuments of the convent's medieval period is the Refectory Church of the Conception of St. Anne, built in an archaic design in 1551 during the early part of Ivan the Terrible's reign. Its elongated form includes a small church in the east, a banquet hall for monastic holidays and a vestibule supporting an unusual hexagonal bell tower. The upper part of the structure is decorated with a folk-like red brick ornamental band in a rhomboid pattern. Visible in our general views of the convent, this distinctive church also appears in my crisp winter photograph of 1972. Intercession Convent, east wall and gate, northeast view from Savior-Evfimy Monastery. From left: Church of Sts. Peter&Paul (beyond convent), ​Intercession Cathedral with restored domes, refectory Church of St. Anne. May 23, 1996.